Old character sheets are still on the sporum and don't need to be reposted. Here is where you put your sheets for characters and groups who participated in the great Chaos War. Height (you can approximate): 3'8"
Abilities: Extremely powerful determination, powerful enough for them to reset a timeline to a particularly strong instance of determination. Frisk, in a combat encounter, reveals their SOUL, a heart-shaped cursor-like entity, and becomes more agile as to avoid bullet hell attacks. Frisk also has the ability to ACT, or perform an action, in order to effectively show mercy and compassion. Despite this, Frisk has no Level Of ViolEnce, 20 hit points, and a low attack power, albeit one that is never used. Bio: One day, a human fell through the barrier within Mt. Ebott and landed in a bed of flowers. Despite a flower's insistence that the world of the Underground was "kill or be killed," that human went on to befriend every monster that lived in the Underground, going out of their way to spare them and share in their hopes and dreams. Even when their caretaker Toriel insisted that they learn to fight, they refused to strike. Even when faced with relentless killers, the human, stalwart in their notions of mercy, never gave up, due to the sheer weight of their DETERMINATION. Even when the limits of their kindness were tested, even when monsters actively tried to kill them, the human never wavered. On their adventure, they made many friends. Papyrus and Sans, the border-patrol skeleton brothers. Undyne, the greatest hero of all Monster-kind. Dr. Alphys, a nerdy lizard scientist obsessed with anime, and her robot Mettaton, a show-bot with fantastic legs and a charismatic personality. They even befriended the desperate king ASGORE, as well as the very flower that wanted to kill them in the very beginning. Frisk talks to other characters, but unless the player receives a prompt on what to say, their dialogue is not shown. During battles, the flavor text describes what Frisk says. Outside of battle, when Frisk speaks on their own, the other character's dialogue box displays "..." to indicate them listening to Frisk. 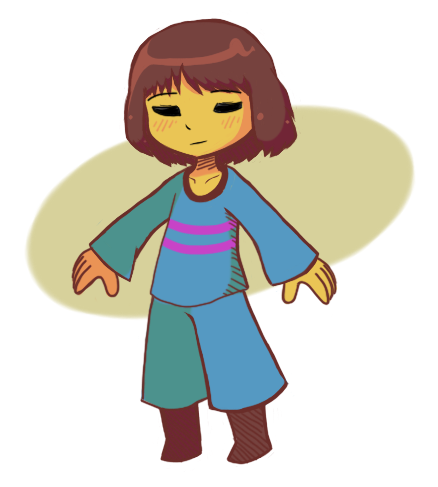 Depending on the ending that the player is moving towards, Frisk can be depicted as friendly, in the case of the Neutral (or especially the Pacifist Route). In the Pacifist Ending, characters such as Asriel make emphasized note about Frisk's kindness, understanding, and grace. This is also the only ending when Frisk's name is given, which implies that this is their true character and personality. Height (you can approximate): 5'10"
Abilities: Can immobilize her opponent with Green Mode, though honorably presents them with a magical spear used to block her attacks. Her spear jabs can pierce through the SOUL, and Undyne has the power to let loose a ridiculous number of them at an adversary. The spear disappears upon returning the soul to its original state. Undyne the Undying is also extremely durable, as Chara had to be at a high LV in order to hold a candle to Undyne's power. Due to her high amount of natural determination, her form is highly unstable, meaning that she will expel bursts of energy from her missing eye, and that she would melt if killed. Bio: It seemed that it was over for the Underground's greatest hero. Undyne's training with Gerson and ASGORE, her friendships and admirers, everybody's hopes and dreams... They all seemed to melt away before Undyne's eyes. Undyne could feel herself dissolving, fatally wounded by the child... the monster... before her. To protect the innocent, Undyne made the ultimate sacrifice. But the Earth refused to die. To protect everybody's hopes and dreams, to truly save everyone she can... That filled Undyne with DETERMINATION. Determination to eliminate this abomination that was once a child. Taking the more powerful form of Undyne the Undying, the true heroine faced the demon for everyone's sake. Seems acceptable. So we've got two undertale characters so far.